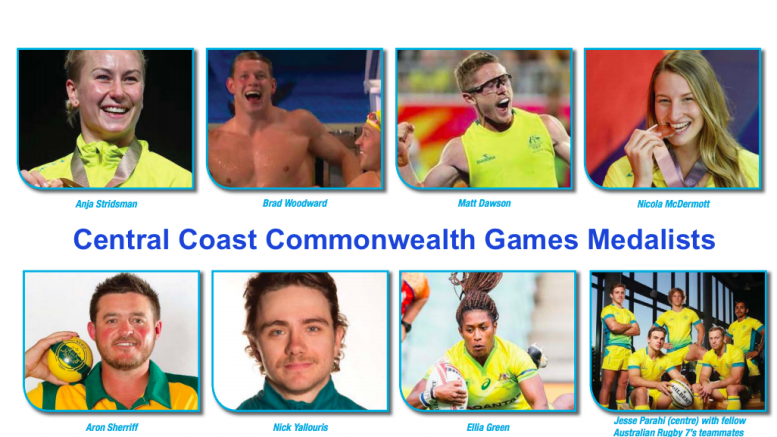 The 2018 Commonwealth Games on the Gold Coast have concluded, and young athletes from across the region have left their mark on Australian sporting history. By far and away the Coast’s most successful athlete was Mingara Aquatic swimmer, Brad Woodward. The 20-year-old rising star will return home with three medals. Woodward is the Coast’s golden boy, quite literally, having won a gold medal in his final event at the Games, the Men’s 4 x 100 Medley Relay on April 11. The impressive result comes off the back of two silver medals for the 100m and 200m Backstroke earlier in the Games. Further to the medals, Woodward swam some incredible Personal Bests, including a 1:56.57 in the 200m Backstroke, an amazing result for a swimmer who only broke 2:00.00 in January. Hockey star and 2008/09 CCAS Male Athlete of the Year, Matt Dawson, didn’t let a significant eye injury hold him back, with the Australian Men’s Hockey team, The Kookaburras, blitzing through the Men’s competition to claim the gold in the final against New Zealand. The Kookaburras were the number one ranked team in the world going into the Games, and with this gold, have reached a milestone of six consecutive Commonwealth Games’ titles. Track cyclist, Nicholas Yallouris, finished 10th in the 1,000m Individual Time Trial. It was heartbreak for the former Kincumber High School student and 2016 Olympic gold medallist, Ellia Green, when the Women’s Rugby 7’s team lost in the final against New Zealand. Despite walking away with the silver medal, the Women’s team will be forever haunted by the now infamous ‘brain snap’ of Cassie Staples, who punted the ball into the stands on the regular time bell with scores tied at 12-12. Commentators speculated Staples was unaware of the locked score, believing Australia to have won. Green had been on the wing waiting to receive the ball from Staples, when she made her premature victory kick. Following the unfortunate lapse in judgement, the Kiwis were able to score the clincher with a long-range try after the siren in the first period of extra time, to claim the gold with a 17-12 win. Members of the Aussie team were seen visibly weeping following the result. Local boy, Australian Rugby 7’s veteran and 2018 Commonwealth Games Team Captain, Jesse Parahi, also lost out in the Men’s Rugby 7s, going down 26-17 against England in their final four qualifying matches. Former Green Point Christian College student and Sydney University Athletics Club star, Nicola McDermott, returns home with a bronze in the Women’s High Jump. McDermott is a standout in her field and was one of the favourites for the gold on the Aussie team, having placed equal third at the 2018 Australian Athletic Championships, with a clearance of 1.80m, which was supported by a string of Games qualifying jumps. Boxer, Anja Stridsman, was another standout local hero and returns home with a gold in the Women’s 60kg Boxing Division. Last but not least, Aron Sherriff, the long-time Coastie who made the move to the Gold Coast in late 2017, also medalled at the Games. He walked away with two silver medals in Lawn Bowls for the Men’s Triples and Men’s Fours events.